Social events during the Holiday Season allow us to reconnect with friends and family, touch base with acquaintances, and meet new people…. Get-togethers with friends, client dinners, charity events, family buffets, company parties…. Sports, “Star Wars,” and Trump may take up a good bit of the chatting time…. But consider taking advantage of any opportunities for candid conversation in order to gather information and advice from others that you can think on and put in the mix for yourself in the New Year…. “Mentoring” includes any time someone can share with you something that might make things easier/better for you on your path…. -How did you come to your current job? -What part of your job do you like most? -What sets you apart from peers and helps you to be successful? -What do you think are the most important things for shaping a successful career? -What’s the best professional feedback you ever received? -What’s something you would do differently in your career if you could? -Do you have any tips on work/life balance for me? 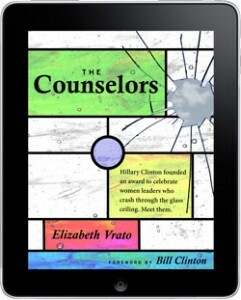 Elizabeth is the author of a book of mentoring stories, “The Counselors: Conversations with 18 Courageous Women Who Have Changed the World” (Foreword by Bill Clinton). A new edition e-book is for sale now on Amazon and other online outlets.